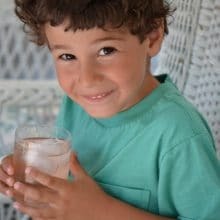 Home » Rose Water & Orange Blossoms Blog – Fresh and Classic Lebanese Recipes » Stories and Recipes » Christmas » Arugula with Sugared Cranberries & Pancetta. And let’s talk cookbooks. As I mentioned recently, I am a cookbookaholic. 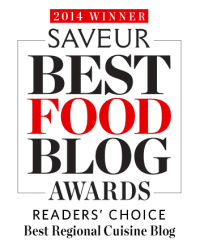 I love to hear about good cookbooks from anyone who is into them. I sort of assume the same of anyone else who likes to collect, cook from, and gift-give cookbooks. So in honor of the cookbook-buying and giving season ahead—in honor of all of the cookbooks we have, want to have, or give—I’m going to take some time in the coming weeks to share some of my favorite books with you. And I’m going to do that by actually cooking from them. I’ll share a delicious recipe from some great books on my shelf to help build our holiday menus. By the time we’re ready to don our clogs and head to the kitchen, or don our boots (don’t know about you, but it’s Michigan here) to head to the bookstore to get after new books for the holidays, we’ll have some great ideas up our sleeves. 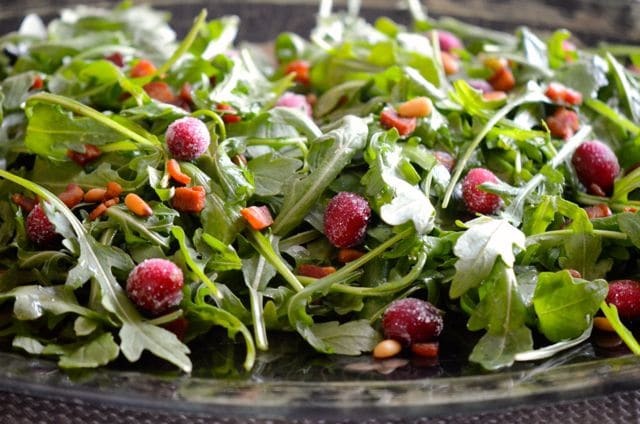 Great ideas that include a salad of snappy arugula with absolutely gorgeous sugared cranberries and salty pancetta. Such a plate of beauty and flavor!! This is one that satisfies my very Lebanese craving for all things tart, and I can’t wait to make it for Thanksgiving and throughout the holidays for a boost of sparkle—and lightness. What a perfect side this is to some of the richer dishes that grace the celebratory table. The recipe comes from my super-talented (adorable and funny) friend Tara Mataraza Desmond’s new book, Choosing Sides: From Holidays to Every Day, 130 Delicious Dishes to Make the Meal (September 2013). Tara fills her book with lots of recipes that inspire, build confidence, and encourage us to discover what creative cooks we really can be. She wrote the thing while she was expecting twins, so I figure she has some secret formula for high, and creative, output that she’s probably patented by now. The book’s “Main-Course Pairings” is a tremendous list of the side dishes that go well with all of the various mains, protein and otherwise, we typically eat. I especially enjoy Tara’s many Middle Eastern-inspired dishes, including a vinaigrette for the salad that uses pomegranate molasses. Clever! Tara, you’re an honorary Lebanese! Oh, and I nearly forgot, until I made this stunning, holiday-worthy salad, how much I love to serve salad on a big platter rather than in a big bowl. That presentation allows a much better view of all of the goodness in the salad, and just makes it special. Note that the cranberries need to be started several hours or a day in advance. They are so sweet-tart delicious, you’ll want to make extras just to snack on. I’ve added toasted pine nuts to the salad, and a little garlic powder, my secret ingredient for most any dressing, to the vinaigrette. Place the cranberries in a medium heatproof mixing bowl. 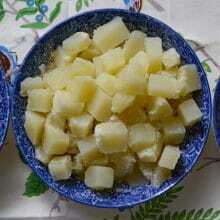 In a small saucepan, make a simple syrup by combining 1 cup of the sugar with 1 cup of water over medium high heat. Bring the water to a simmer, then reduce the heat and simmer until the sugar is completely dissolved, 5-7 minutes. Remove from the heat and pour the hot syrup over the cranberries. Cover the bowl with plastic and chill for at least four hours and up to 24 hours. Line a baking sheet with parchment paper (for easy clean-up). Strain the cranberries from the syrup (the syrup can be used for cocktails, homemade sodas, or discarded). 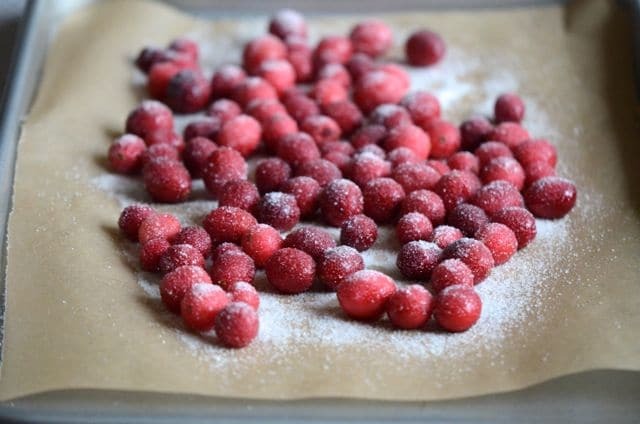 Spread the cranberries out on the baking sheet and sprinkle the remaining 3 tablespoons of sugar over them. 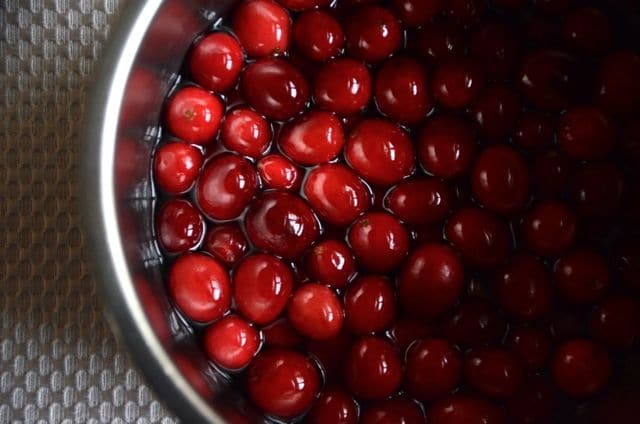 Roll the cranberries around in the sugar to evenly coat them, and let them dry at room temperature for 1 hour. Heat a large sauté pan over medium heat. Add the pancetta and cook until golden, stirring occasionally. 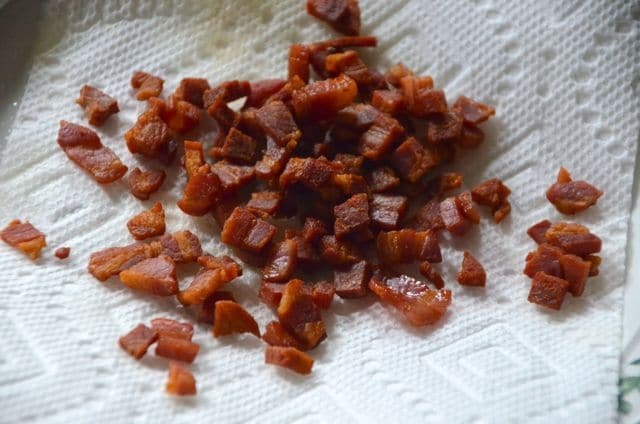 Transfer the pancetta to a plate lined with paper towel. Make the vinaigrette by whisking the pomegranate molasses, sherry vinegar, salt, pepper, and garlic powder in a small mixing bowl. Slowly add the oils, whisking until the mixture is emulsified. On a large, wide platter, toss the arugula with the vinaigrette. Sprinkle with the cranberries, pancetta, and pine nuts and serve immediately. 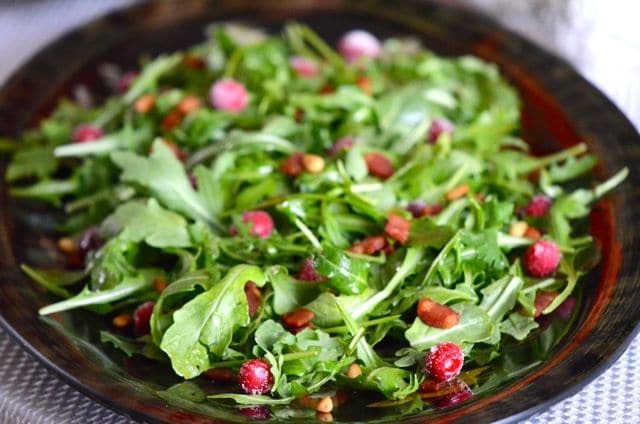 13 Responses to "Arugula with Sugared Cranberries & Pancetta. And let’s talk cookbooks." 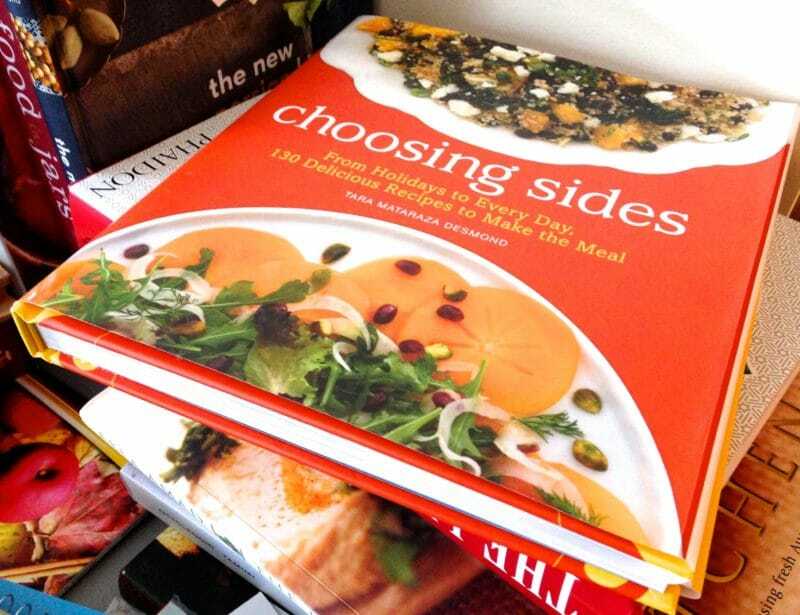 I *love* this idea of sharing favorite recipes from your cook book collection! I started collecting many years ago when I house sat for Verni Tully – a local realtor in Harbor Springs who had an amazing cook book collection. The whole Winter at her home on main street – I copied recipes from her books to recipe cards – and now have quite a cook book collection of my own. I was thinking about donating them to the library – because lately I look anything up on line … but your post today has me re-thinking that idea – I need to dig back into them and remember how enjoyable it is reading a great cook book for inspiration! Cookbooks are wonderful. I love big, thick cookbooks with beautiful pictures and stories. Sometimes these end up being “kitchen table” books akin to the coffee table book. If I share a special event with friends/family at a restaurant that has a cookbook, I love to give this as a thank you gift for sharing the celebration with me. For instruction/inspiration, I have different favorites depending on what I want to make. For baking, I like the standby: red & white from Better Homes & Gardens. For ice cream, I love David Lebovitz’s Perfect Scoop and also like Molly Moon’s book. Diana Kennedy has a wonderful book for Mexican recipes. Tomes like Joy of Cooking, The Silver Spoon and Julia Child’s are all classics for good reason. 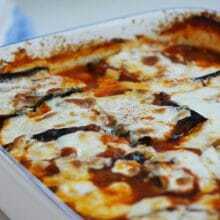 For everyday (easy) food, I will consult Giada (high school classmate! ), Ina Garten, How to Cook Everything, blogs (Silver Pen, Water is Smiling, Rose Water, Smitten Kitchen) and magazines (I have way too many to keep up!). I also have several vintage cookbooks that my MIL gifted me that were her parents including a 2 part Gourmet Cookbook from 1957 and a Church parish cookbook (Maryland shore) that includes directions on how to dissect a terrapin and lots of delicious but simple crab recipes. I love the images I create in my head inspired by the vintage cookbooks. Look forward to seeing what you share with us! Rae Ann, you’ll find it at Toski Sands, and hopefully soon at Glen’s at my request! Maureen, I love your blog…ran out to buy the pomegranate molasses to make the wonderful salad you posted! Your relative, Nancy Marshall, put me onto your blog, and I love it! I summer at Pt. Lookout and live in the San Fancisco area the rest of the year! Thanks so much! Wonderful to have you here–you live in my favorite places! Please keep in touch! Thank you for the wonderful recipes!!! Thanks Sheri–because it’s so easy to leave out the pancetta and still make this a delicious salad, it is great for vegetarians. I’ll note that in the headnote! I made this twice last winter. Once with pancetta and once without. A big hit both times. As beautiful for the eyes as it was for taste buds. The pine nuts were such a nice touch in this too!